With solid experience and a proven reputation in the US insurance industry, every single one of eNoah’s strategies and solutions improves the insurance lifecycle for you. 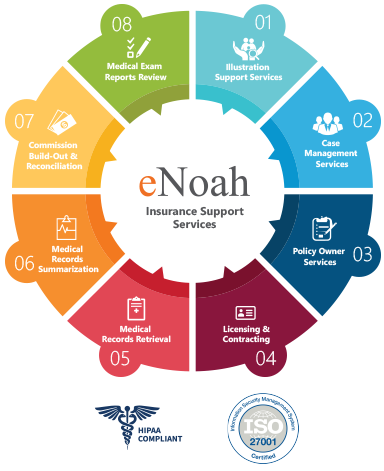 eNoah provides Information Technology Support as well as Business Process Support services for IMOs, Insurance Carriers, Insurance service companies, Broker & General Alliance companies, and Examination companies that help clients to operate efficiently, reduce cost and have faster turnaround times. eNoah provides scalable cost effective solutions based on volume and client’s specific needs. With solid experience and a proven reputation in the US insurance industry, every single one of eNoah’s strategies and solutions improves the insurance lifecycle for you. Our robust technology platform ensures thorough completion of the entire process, facilitating quality reviews, reports, and scalability. eNoah is a client-focused partner with over a decade of experience in delighting customers. We offer unique engagement models to fit your specific needs. eNoah offers customized business process support and IT services for insurance carriers. Our Carrier centric services are tailor made for unique business requirements of clients including Illustration suppor, medical records summarization & retrieval, case management, claims processing, and ad-hoc projects. We also offer end-to end IT services for carries. Marc has over 18 years of experience in the insurance industry and currently serves as Vice President and Head of Business Development for AIMCOR Group, LLC, a national marketing organization representing sixteen top insurance companies and over $100M a year in premium. Marc joined AIMCOR in September of 2014 and was instrumental in launching AIMCOR’s institutional platform; Enterprise Insurance Group (EIG) which he still continues to lead today as the Managing Director in addition to his other responsibilities. In his role, Marc is responsible for leading the overall marketing and business development efforts of AIMCOR, working closely with its member firms and insurance carrier partners to grow sales and drive adoption of insurance products through traditional, institutional and alternative distribution channels. Prior to joining AIMCOR, Marc was the CEO of a brokerage general agency (BGA) in Little Rock, AR. Starting in 2006, as National Account Manager, he served in various roles within the organization including Director of Marketing, Business Development and Chief Operating Officer, before assuming the top leadership role in 2011. During his tenure, Marc led the efforts of repositioning the agency into the alternative distribution and institutional markets, finding growth inside of broker/dealers, banks and property casualty firms. In addition to diversifying revenue sources, Marc also realigned the operations and new business departments redirecting their focus from processing to producer retention and upsell identification programs creating a differentiating value-add when compared to his competitors in the space. Prior to his time at the agency, Marc worked for one of the nation’s largest insurance carriers and also as an independent advisor. Today Marc is actively involved in the industry and currently sits on the Industry Innovation and Leadership Task Force, SEC Working Group Committee, and two insurance carrier advisory boards. He has also served on various other committees including NAILBA’s Professional Development Committee, AALU’s Independent Brokerage Task Force, the Financial Industry Insurance Standards Committee, and DOL Impact Committee in addition to consulting with carriers and vendors on product and technology development. Marc has presented across numerous industry meetings and is recognized for his ability to market / brand organizations as well as for his insights surrounding the industry’s efforts to streamline processing and improve efficiencies. Marc has been published as a subject matter expert in various industry publications writing articles and being interviewed for his perspective on how to strengthen the value proposition of insurance intermediaries. Marc has an undergraduate degree in marketing and master certificates in business and organizational management. Marc, his wife Lindsay and their young son Grayson live in the Philadelphia area where, in his free time, Marc enjoys giving back to his community, and playing golf, which has been a passion of his since he was five. Marc serves as a Principal Advisor to eNoah’s management and senior leadership team helping them improve the position, knowledge, and innovation capabilities of their financial services industry vertical. Portal to manage orders and track status for Service Provider. Real-time reporting & sales force email integration. APS retrieval CRM application for APSR Service Provider.